“Way back, years ago…” I can remember so many stories beginning with those words. My family, especially my little Mawmaw, were great story-tellers. Mawmaw was my Dad’s mother, born in Delta, Alabama in 1899. Back then, Delta was little more than a wide place in the road in Clay County. 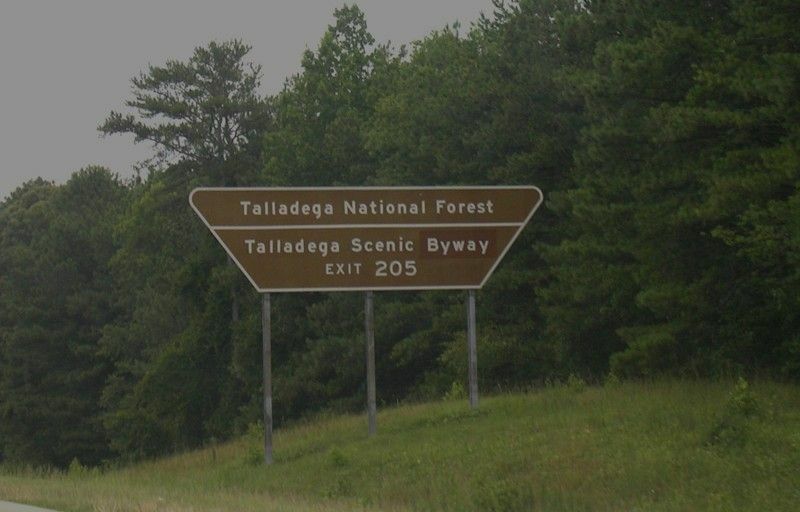 Now, it’s known as an “unincorporated community” of 197 souls just at the edge of the Talladega National Forest, 392,567 pristine acres of mountains, streams, and lakes. Well, back to my story; way back years ago my family and I would go into the “Reservation” as it was called then to swim, barbecue, or just enjoy nature. Several times we visited the Shoal Creek Church and its adjoining graveyard. 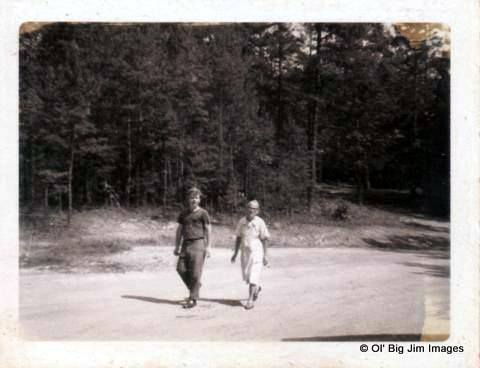 I remember one time in particular that Mawmaw and I wandered through the burial ground. Even though I was approaching my teen years and well capable of reading, she read the inscriptions of every single legible tombstone we came to. My grandparents were the oldest people I knew; born in the previous century, but these folks were even older than them. 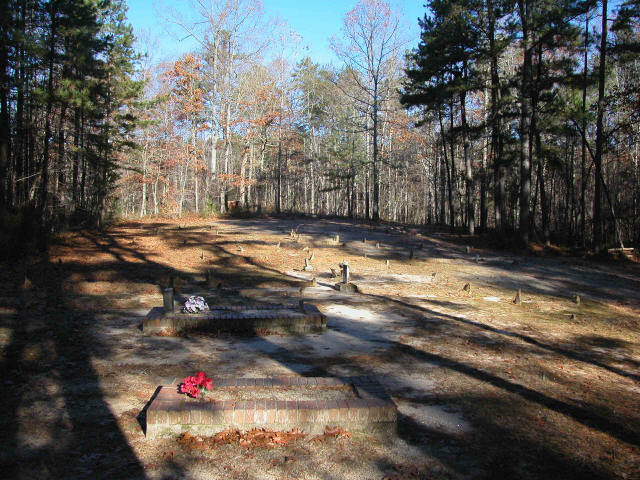 In my youthful naivety I thought these must be the oldest graves in all of Alabama. After leaving the graveyard, we went to the church. Oh my, what an experience that was, and continues to be! Long, straight trees were logged, squared off, and mortised with wooden pegs to form massive walls. The chinks were filled with mud to keep out the cold winter air. Tiny windows were covered with wooden shutters that could be opened or removed in warm weather. 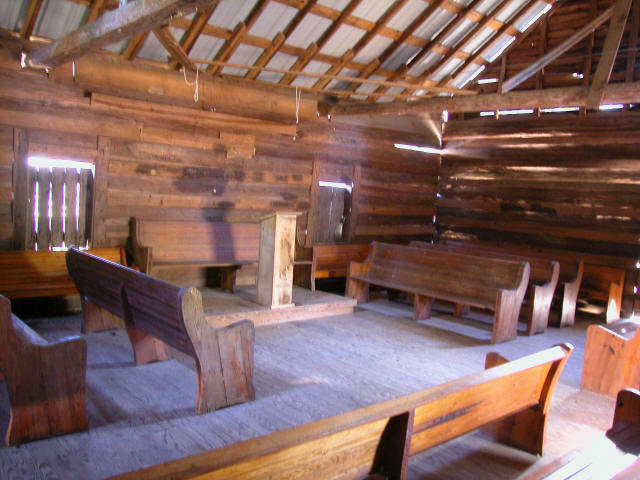 The floor, worn smooth by many decades of shoe soles is made of broad boards with a small dais holding a single pew and a narrow pulpit. Wooden pews for the congregation and choir fill out the rest of the church on all three sides of the pulpit. The peaked roof, now made of thick, heavy sheets of metal is open with broad, rough beams of the same wood as the walls stretch across to form the trusses. Here and there, beams of light penetrate cracks and crevices. The colors of the wood construction throughout combine with the simple architecture to present a rough, unadorned beauty. 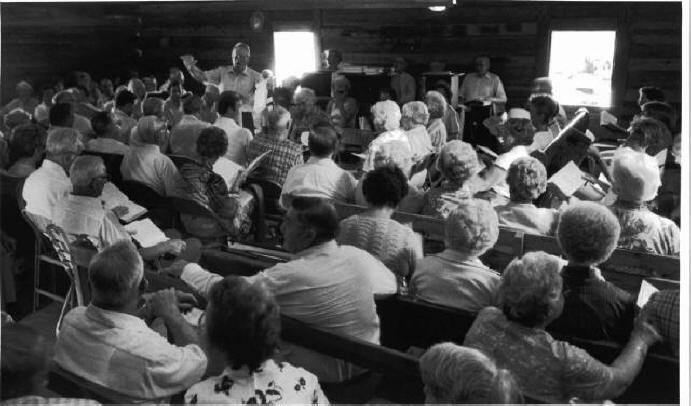 No one is really sure when Shoal Creek Baptist church came into being. 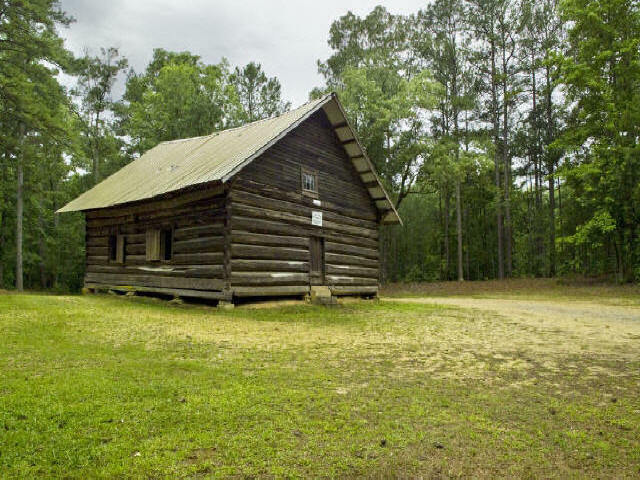 White, European settlers from Georgia and the Carolinas ventured into this part of Alabama, previously occupied by Creek and Cherokee natives looking for land they could settle and farm. Their numbers included loggers and hunters as well as farmers. I strongly suspect that if you wandered around the forest, especially near streams, you might even find a whiskey still or two. The building that now stands, the third in its line, was built around 1895 with 139 members. In addition to serving the spiritual needs of the congregation, the building was sometimes pressed into service as a schoolhouse. By 1914 the last members of the Shoal Creek Church had moved on to greener pastures and regular services ceased. Nowadays, folks hire the building for weddings and family gatherings, or special services of one church or another. 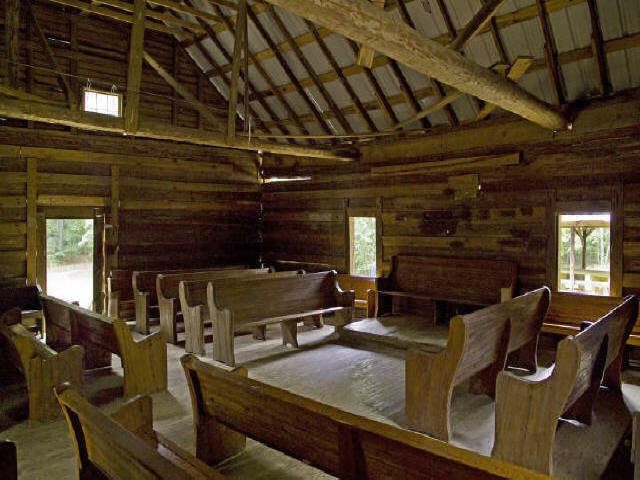 The high point of the year for Shoal Creek Baptist Church is the annual Sacred Harp singing. For a half century the singing was on the fourth Sunday of July or August. Thirty five years ago, Labor Day was chosen for the singing and it packs the house every year. Everyone brings lunch and a grand time is had by all. You can find a great deal more information about Shoal Creek Church at their excellent website by clicking here. All but one of the pictures accompanying this post came from their site, with their very gracious permission. 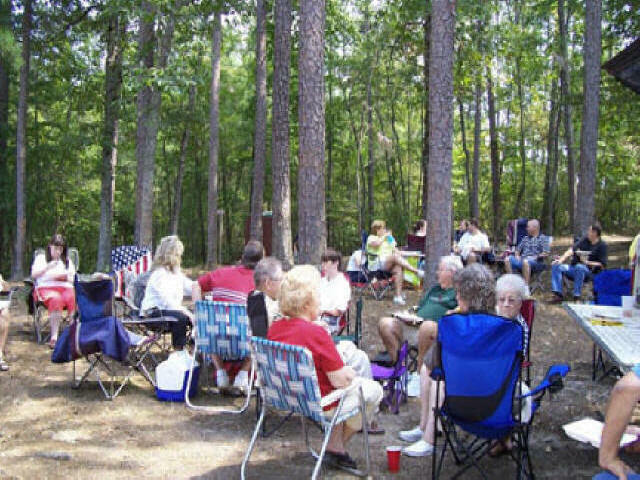 If you ever find yourself near the Talladega National Forest, it would be well worth your time to join the thousands of other tourists who have visited the site to soak up the atmosphere and enjoy some quiet, peaceful time to feed their souls. This entry was posted in Random Musings and tagged Alabama, Memories, northeast alabama, random thoughts, writing. Bookmark the permalink. Thanks David! Not fatigues, as I remember I was dressed all in black that day. I think I was around 14 in that picture. Thanks for the recommendation, David. I think I know this book. I think I’ve read some excerpts from it and it may be on my iPad in my TBR list. That is a beautiful story and take it from Jim’s mother every word is true. I loved it. I have a picture made the same day with all the family about 25 or so people. A wonderful fun day and great time had by all. You can’t do better than having your very own Mother verify your stories!